For years, Dr. Nathan Goldstein, chief of the palliative care division at Mount Sinai Beth Israel, would hear a common complaint from his colleagues. They saw the need to have end-of-life planning conversations with their critically ill patients, but taking a half hour or more for those talks was a tough prospect because they were not covered by Medicare. That changed last year when the CMS finalized the creation of the new codes in the 2016 physician fee schedule and allowed clinicians to bill Medicare for those conversations. The CMS rates range from $80 to $86 for the first 30 minutes and about $75 for each additional 30 minutes. "What this code does is really free up physicians to talk to patients about the things that really matter to them," Goldstein said. "It's so much easier to just order that next test as opposed to sit down and have a really complicated conversation, so this code really allows people to do that." The creation of this billing code has been an important catalyst for ensuring that providers, Medicare beneficiaries and their families all know the patient's desired care for his or her final days and for preventing unwanted, intensive medical interventions. "It's a conversation that was not occurring as often as it needed to," said Dr. Michael Wilde, vice president and chief medical officer at Sanford Health in Sioux Falls, S.D. Over 22,000 providers billed Medicare for end-of-life planning appointments on behalf of more than 570,000 beneficiaries in 2016, the first year these services were billable, according to the CMS. The agency has noticed that provider use of the codes is increasing, as only 220,000 people used the services in the first six months of 2016. Clinicians credit the jump to more doctors hearing about the codes, and the codes being added to electronic health record systems. Providers billing under the code received $43 million in Medicare reimbursement and another $50 million in patient deductibles and coinsurance. Beyond ensuring a patient is getting the care they want, a hospital can also generate significant savings by not performing unwanted care on a patient. "Because the patient's wishes are not known there are often maximum care decisions made," said Dr. Janis Orlowski, chief healthcare officer at the Association of American Medical Colleges. "We do everything to keep them alive, and that may not meet the actual wants or needs of the patient." A study in the Critical Care Medicine academic journal last year found that intensive-care unit costs could drop by as much as $1.9 billion if advance care planning and ICU-based palliative-care consultation became the standard of care for patients with chronic and serious illness. The need for advance care planning conversations has increased in recent years as thousands of baby boomers become eligible for Medicare each day and new medical advances are discovered that can extend the length, but not the quality, of life. As things are now, providers are often put in the uncomfortable situation where an ailing patient is unable to speak, and frantic family members want any and every care measure available to keep that person alive, according to Dr. Carl Olden, a family physician in Yakima, Wash., and an American Academy of Family Physicians board member. "We struggle not to give false hope, and it's a frustrating and challenging time for physicians," Olden said. "We spend a lot money at the end of life that doesn't provide quality or meaningful restoration of function." While providers and industry stakeholders are pleased with the jump in advance care conversations, more work needs to be done, according to Donald Taylor Jr., a Duke professor of public policy. The number of patients who used the codes last year account for only 1% of the Medicare population. He suggests more provider and beneficiary education could accelerate use. 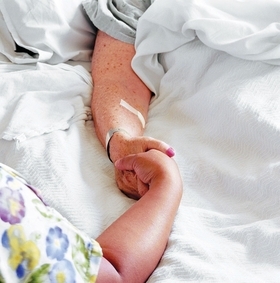 The CMS could offer incentives for end-of-life conversations by creating quality measures that would hold providers accountable if advance care plans on file were actually implemented, according to Michael Richards, executive director of government relations and external affairs at Gundersen Health System, an integrated healthcare organization serving counties in Wisconsin, Minnesota and Iowa. "That's the next piece to ensure that these conversations providers are having are worthwhile," Richards said.